What Do YOU Think About Space? The man in charge of setting the president's grand moon-Mars vision into motion is looking to ordinary Americans for advice. The journey begins Wednesday with the first in a series of public hearings on the space exploration policy put forth by President Bush a month ago. "We want the public to feel that they had input into this process because they're the ones who are going to have to pay for it," said Edward "Pete" Aldridge, chairman of the president's space commission. American taxpayers must be consulted — and politics sidelined — if astronauts are to travel to the moon, Mars and beyond in the coming decades, Aldridge said. "We will only make a dent in this program in the next four years, so we've got to take the political aspect out," said Aldridge, a retired Defense Department official who was tapped by Mr. Bush for the job. "It cannot be sustainable if you make it political." Aldridge and his commission have 120 days — until early June — to make their recommendations to President Bush. "We could spend eight months and look at a thousand issues," but Aldridge said he instead will focus on a top 10 list. He said those priorities almost certainly will touch on affordability, the talent base at NASA in coming years and potential contributions by other countries and the commercial sector. This may mean some bold initiatives and changes for NASA because "it's not a business-as-usual kind of thing," he said. On Jan. 14, the president unveiled a policy for space exploration that would put astronauts back on the moon by 2020 and have them pushing toward Mars perhaps a decade later. He put Aldridge in charge of laying out a plan. Eight others — planetary scientists, corporate executives, former government officials — were appointed to the commission and reported to work this week. 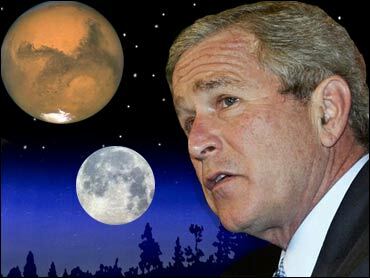 When the first President Bush tried to spearhead a space exploration initiative back in 1989 with similar objectives, it flopped because of the estimated price tag: $400 billion to $500 billion. "People had sticker shock and so the enthusiasm for it didn't take over and so the program kind of died within a few months," Aldridge said in a phone interview Monday from the commission's offices in Arlington, Virginia. The current plan should fit within NASA's budget, Aldridge said, and span 40 years — 10 presidential periods. That's why Aldridge is planning three or four public hearings from coast to coast and inviting average Americans to offer opinions not only at the formal meetings but via the Internet. The commission's Web site welcomes suggestions. One of the commission's key objectives, Aldridge said, is to encourage youngsters to study math and science and have them dreaming big: "Hey, yeah, I want to be the first person to walk on Mars." Wednesday's hearing in Washington has a rather typical inside-the-beltway lineup of speakers that includes leaders of previous space advisory panels and trade-group executives. Aldridge will go farther afield over the next four months to hear from a cross-section of people in science, technology and education. He realizes some may complain and question the benefits of the space program and say, "'We don't see any benefits, why are you doing all this stuff?' But that's all right, too. "We want to hear from those who may not have quite the same viewpoints," he said.